I really am not sure why it has taken me two weeks to write this entry, but it has and I apologize. Thankfully I took notes on each cheese so I would not forget. In my original taste testing episode, I simply stopped at the local Whole Foods and picked up a few “nibblers,” or remnants of cheese, that I found interesting. I went home and tasted. Simple but good method. However, this time, I did things slightly differently. On September 13, I spent 20 or so minutes tasting various cheeses at the local, large Whole Foods. (Not the smaller, old Wild Oats turned Whole Foods.) Instead of being forced to choose from only the nibblers, we (my mom, dad and I) were able to pick the brain of the cheese monger (His name is Jason. You should go say hi to him!) and taste any cheese we wanted. What was also awesome about this cheese tasting adventure was that there was a very knowledgeable customer also cheese tasting. Thanks to his expertise, we tasted some very interesting cheeses and went home with 4 cheeses and a desire to taste more. One cheese that I almost tasted, was rubbed in lard. Being that I keep Kosher, that was a no-no. I do wonder how that would have tasted, though. I also learned, courtesy the other customer, that a man who knows his cheeses has an easier time picking up the ladies. Is that true? Ha. These are the 4 cheeses that I tasted, along with my thoughts. Parrano is aged for five months, developing its nutty Parmesan flavor while maintaining the firm, smooth texture of a young Gouda. This perfect combination brings you the best of both worlds: a cheese that is full of flavor and versatile enough to cut, grate and melt. Most of the cheeses I tasted on September 13 were very yummy, with the Parrano being one of the leaders of the pack. The Parraono was very firm, as it is a semi-hard/hard cheese, but it did have a creamy, buttery taste. It was also very nutty. Everything that I have read online compares this to a cross between a Parmesan and a Gouda cheese, which definitely makes sense and works well. As Parrano is a meltable cheese, this not only makes a great companion to a cheese tasting but also to any prepared dish. Cheese Essentials, which I am slowly making my way through, recommends one to use semi-hard cheeses for grilled cheese sandwiches. Interesting suggestion if I do say so myself! 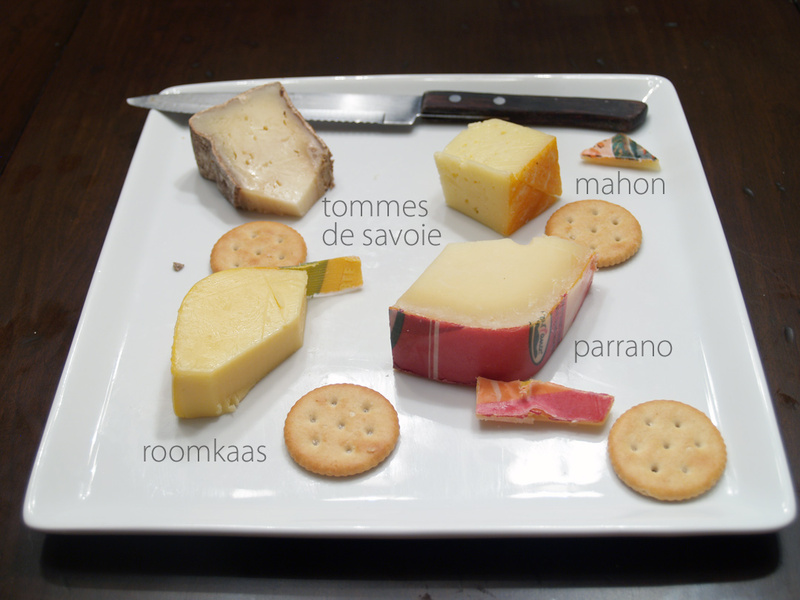 Roomkaas is also a Gouda-style cheese but didn’t have the nutty, firm texture that the Parrano did. It was soft and creamy and had a great smooth finish. 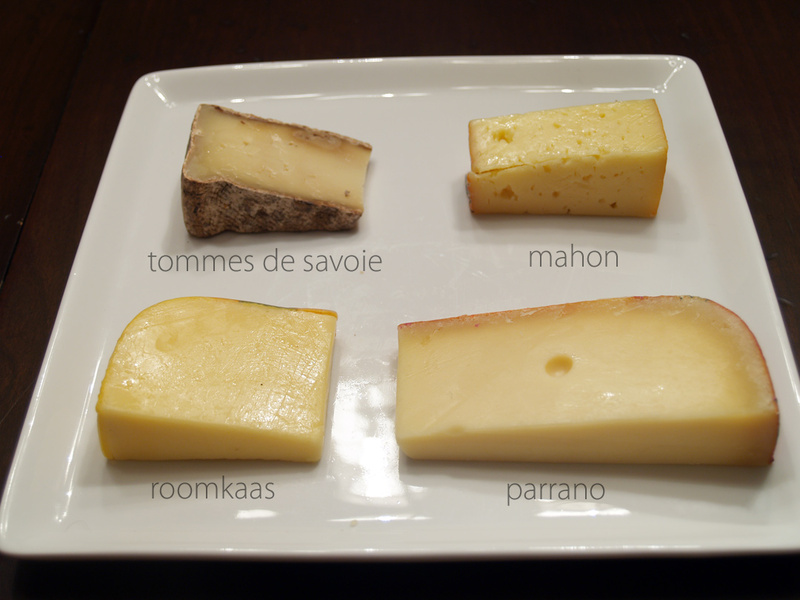 Comparing the Parrano and Roomkaas seems like a great comparison between a semi-soft and semi-hard cheese. This cheese, when left out of the fridge for a few hours, becomes a spreadable cheese, which would be great for crackers or bread. 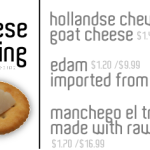 The Internet tells me that Roomkaas literally translates to “cream cheese,” but I do not know how reliable that information is. While googling Roomkaas, and looking within Cheese Essentials, I noticed that Roomkaas was always followed by the descriptor double-cream. As a cheese novice, I had to investigate what exactly double-cream means. Any of various cow’s-milk cheeses that have been enriched with cream so that they contain a minimum of 60 percent milk fat. 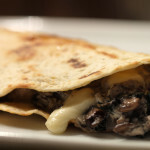 Triple-cream cheeses must have at least 75 percent milk fat. Both double- and triple-creams can be fresh or ripened. They share the distinction of being seductively soft and creamy in texture with a mild, slightly sweet flavor. BOURSIN is an example of a triple-cream cheese, whereas CREMA DANIA is a double-cream. Because of their natural sweetness, these cheeses are perfect when served with fruit for dessert. Mahón is the capital and port of Menorca, the most northerly of the Balearic Islands, in the Mediterranean Sea. It is also the name given to all cow’s milk cheeses produced on the island, as all cheese were exported from Mahón via the Mediterranean Sea. Oddly enough, everything I have read online about this cheese is not what I experienced with this particular variety. CheeseFromSpain.com tells me it is “…slightly acidic and salty, but not buttery…” while About.com tells me it is “…Salty, tangy and grassy…” and finally ArtisinalCheese.com tells me, most likely about an aged version, that it “boasts a certain sharpness, and its lemony, salty flavors evince the rural Mediterranean seascape.” I would say that none of these descriptions match my experience. What I personally tasted with this Mahon was a very mild cheese that was more about texture and less about taste. 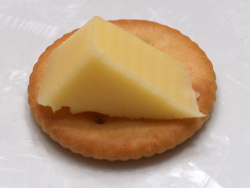 There was a small hint of tang, which seems to be characteristic of this cheese, but it was not overwhelming. I would assume this was more of a younger version of Mahon which hasn’t fully aged and shown its complete flavor just yet. I would recommend this cheese as well, but would hope that the taste was just a bit more pronounced. About Tomme de Savoie: “Tomme”is a generic term and means in French a wheel of cheese. “Tomme” is followed by the name of the village or the region where it is made as in “Tomme de Savoie”. Tomme de Savoie making: Because the cheese is usually made with skim milk, Tomme de Savoie is low in fat content, from 20 to 40%. Tommes de Savoie made in the summer are made as the cows had gazed the mountain grasses. 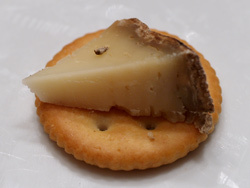 Tasting Tomme de Savoie: Tommes de Savoie has a beautiful gray-brown rind. The pate is firm with flavor of nuts and sometimes grass. Tasting advices: Work well paired with sausages, fruits, or bread. It seems that the final cheese I taste is always the most different. Last time was the Manchego, which to me, had a very unique taste that I was unsure of. I feel the same way about the Tomme de Savoie. 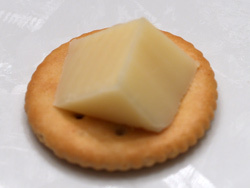 Again, as was the case with the Manchego, I am not saying I didn’t like the cheese, but even in one bite I went from hating to liking to totally unsure. These are the first times that I am tasting cheeses that are out of my normal palette so it will take some getting used to. Regardless, the rind looks amazing. 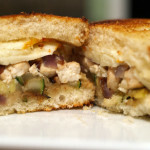 The Tomme de Savoie had a very strong, tangy taste that definitely made you take notice. It was different for sure. The texture was Brie like. If you have tasted Tomme de Savoie, please let me know your thoughts in the comments below. I am curious to see if you like it. This choice was recommended by my customer friend and I am glad he suggested it so I could taste something different and unique. As is the case with all of these Cheese Tasting entries, please let me know if you have tried any of these cheeses and if so, what you have used them for (tasting, entrees, etc). I am all for learning so please educate me! 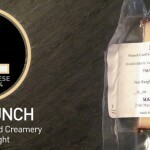 Next entry, I will be featuring Drunken Goat Cheese, Sole Gran Queso and Sartori Bellavitano Raspberry, all great cheeses. Until next time, happy cheese! Posted in Grilled Cheese and tagged double-cream, france, hard cheese, holland, mahon, parrano, roomkaas, semi-hard cheese, semi-soft cheese, spain, tommes de savoie. 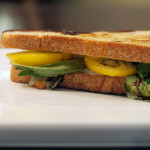 ← Why do you blog [about food]? I consider myself fairly knowledgable about cheese. But I was only familiar with one of these cheese, you tatsted…the Savoie. So the info you provided on the others was appreciated. These are all new cheeses to me (at least, if I have eaten them, I wasn’t aware of the names!) – I particularly like the sound of the parrano, which I’ll have to look out for. 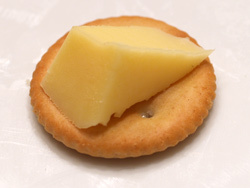 The manchego that you mentioned, though, that’s a favourite of mine – just love the stuff.